Grape leaves…some of you are probably scratching your heads right now, thinking “hey, aren’t you fermenting the wrong part of the vine?” Hang in there with me, though. Grape leaves are actually very tasty, especially when they’re naturally pickled in brine. Not only that, they’re also very high in vitamin A, which has all sorts of benefits from supporting vision to helping build bones. Grape leaves can be added to just about anything…soups, stews, rice dishes and casseroles. Their most popular use, however, is in the Greek dish dolma…grape leaves stuffed with meat and rice. Right now, the grape vines in our back yard are going crazy! As long as I’m picking grapes, I may as well harvest the leaves as well. I found this great article on grape leaves, and was excited to try preserving them and using them in recipes. It’s easy to preserve them naturally! Keep a jar or two of these in your fridge, and you’ll be ready to add a bit of exotic flair to meals and appetizers all year round. 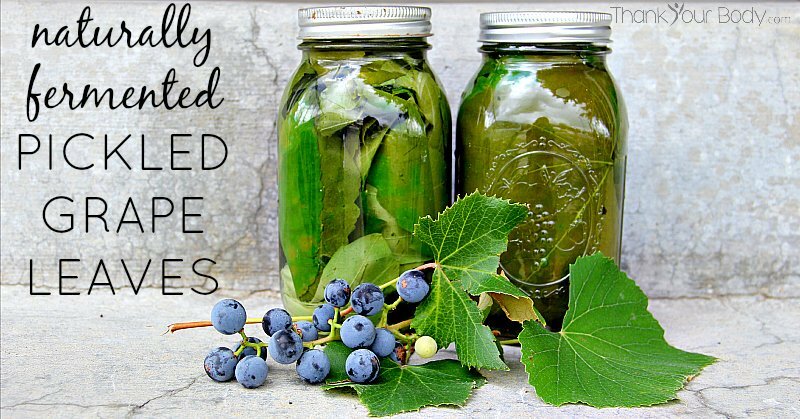 When you’re making naturally fermented pickled grape leaves, the first thing to consider is that you need to make sure you’re using grape leaves and not leaves from a different vine. 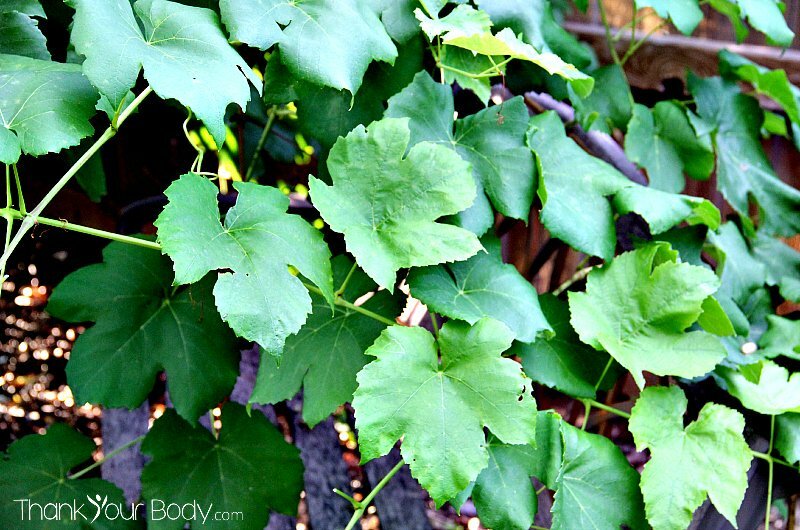 That might sound like an unnecessary word of caution, but there are some vines that look a lot like grape vines but are actually poisonous. Of course, if there are clusters of grapes growing on the vine it’s a safe bet that you’re picking grape leaves. Here’s a guide to wild grapes with photos, if you’re unsure. When in doubt, don’t risk it! Once you’ve determined that you’re dealing with the right vine, it’s time to start picking. This time of year is actually not the best time to harvest grape leaves, they are more tender earlier in the season…but they’re still good if you pick them now. Look for leaves that are free of holes and tears, and not damaged by insects. You want them to be fairly large…about the size of your hand. Also, make sure that you’re picking from vines that have not been sprayed with anything! When you’re ready to preserve the leaves, wash them well. Remove the stems…I like to use kitchen shears to snip off the stems, taking out a small triangle from the base of the leaf. This makes it a little easier to roll the leaves later. Mix up some brine, add a little whey or sauerkraut juice (here’s how to make your own sauerkraut) and set it aside. You’ll want to roll up the grape leaves before putting them in a mason jar, the most expedient way to do this is to stack the leaves in piles of 8-10, carefully roll them up, and then slip the rolls into the jar. I was able to fit about 30 leaves into a quart sized jar using this method. Once the jars are full, just pour the brine over the leaves and screw a cap on the jars. Leave the jars on your kitchen counter for about a week, opening the lids every day to allow gas to escape. Then, pop them in the fridge or a cool spot in the garage and store the for up to a year. 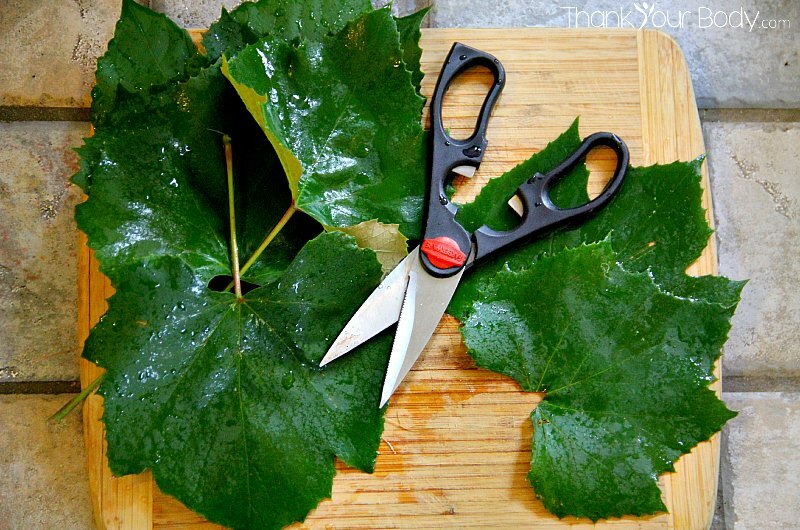 It’s not hard to preserve grape leaves, and it’s well worth it when you consider how hard it is to find organic grape leaves…and how expensive they are if you do find them! Naturally fermented pickled grape leaves can be used for so many delicious dishes! Wash the leaves, and remove their stems by snipping a small triangle out of the bottom of the leaf (I use kitchen shears for this). Stack the leaves in stacks of 8-10. Carefully roll them and place them into a clean quart-sized mason jar. Repeat until your jar is full. Make a brine by dissolving the salt into the water. Add the whey or fermentation liquid to the brine. Pour the brine into the jar, making sure that all the rolls of leaves are completely covered. Tuck an extra grape leaf over the rolls to make sure they all stay below the brine. Cap the jar. Allow the leaves to ferment at room temperature for 5-7 days, loosening the lids once a day to allow gas to escape. Place the jar in the fridge (or in a cool place...make sure it's consistently quite cool or the leaves will keep fermenting) and keep for up to a year. Have you ever cooked with grape leaves? What’s your favorite recipe?